This is a very pretty Pandora sterling silver soltaire ring with a new 6 ct. cushion set citrine stone. Size is 6.75. Ring setting is authentic and in very good condition having just been professionally cleaned. Together this is a stunning ring. Comes in a gift box with free shipping. Cute ring, see my other Pandora. 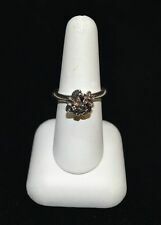 New Size 52 Pandora Dancing Diamond Cognac aka Funny Bones Ring Runs Small! Holy cow was I thrilled to find these! I haven't seen any in ages! US 6 the genuine Pandora Cognac Dancing Diamonds AKA Funny Bones Ring. This ring runs small because it is a wide ring but looks great on your pinky! We will not send a combined invoice unless it is requested. Item Markings: 925 ALE. We are not able to make any exceptions to this policy. Swirl & Pearl Stack-able Band Ring Size 7 ALE 925. Set includes original Pandora Box. Bought out a Pandora jewelry closeout. Genuine Pandora, never worn. Gemstones: Peridot. Size or Length: Size: 7.5; width of band at bottom: ~2.3mm. Type of Jewelry: Ring. You can count on us to be factual and have clear accurate photographs which are not "edited" to deceive. Bought out a Pandora jewelry closeout. Genuine Pandora, never worn. Weight of piece: 3.5 grams APPROX. Type of Piece: Ring. You can count on us to be factual and have clear accurate photographs which are not "edited" to deceive. New ListingPandora He Loves Me Ring Sterling Silver and 14K Gold 190613D Size 7. Very Rare. Very Rare. A charming Sterling Silver floral design is enhanced with a sparkling Diamond set in 14K Gold atop a smooth Sterling Silver band. This ring is simply beautiful. Pandora Sterling Silver Rose Quartz BUBBLES Ring. Weight -. 145 ozt / 4.5 grams. Size 6.75. Silver is marked. Bought out a Pandora jewelry closeout. Genuine Pandora, never worn. Type of Jewelry: Ring. Total Weight of Item: 1.7grams. You can count on us to be factual and have clear accurate photographs which are not "edited" to deceive. Silver is marked. Bought out a Pandora jewelry closeout. Genuine Pandora, never worn. Type of Jewelry: Ring. Size or Length: Size:6.75; Width:~1.8mm. You can count on us to be factual and have clear accurate photographs which are not "edited" to deceive. Rare square Pandora ring. Some scratches. It's stackable. Silver is marked. Bought out a Pandora jewelry closeout. Genuine Pandora, never worn. Type of Jewelry: Ring. Total Weight of Item: 2.0grams. You can count on us to be factual and have clear accurate photographs which are not "edited" to deceive. Bought out a Pandora jewelry closeout. Genuine Pandora, never worn. Type of Jewelry: Ring. Size or Length: Size: 8.25; width:~8.4mm. You can count on us to be factual and have clear accurate photographs which are not "edited" to deceive. PANDORA Silver Royalty Stack Ring S925 ALE Size 58 USA 8.5 EUC Collectible! 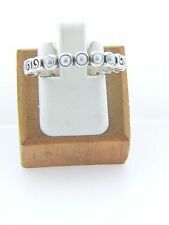 Lovely collectible Pandora stack ring "Silver Royalty" with 10 CZ sparkly bezel-set faceted stone accents. Antique finish. Clean & polished. Perfect thumb ring! Nice larger size. EUC condition. This is a GENUINE 14k Yellow gold & BLACK SPINEL RING TITLED SHINING STAR...& this ring makes a statement! A Beautiful faceted cut black spinel is set in a beautiful 14k gold ornate setting. Retired and retailed for over $600.00 when it first came out. 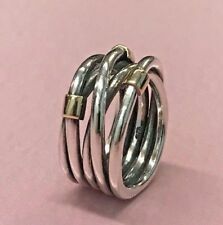 PANDORA | 14K GOLD & STERLING SILVER "ROPE" RING(#190383). 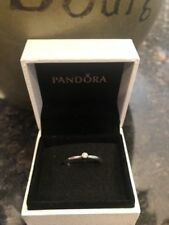 Authentic Pandora 14k Gold Heart Stack Ring Size 52. Condition is New, comes with dust pouch. Shipped with USPS. Beautiful solid yellow gold. Any questions please feel free to ask. Thank you! Immediate payment is required All sales are final Will not ship outside USA Thank you for looking!!! Pandora black onyx ring comes with a pouch. 4 Preloved Pandora Rings.... Stars, Roses w/Freshwater Pearls, Changing Seasons and Opposites Attract w/14kt Gold...All Sz 60, in excellent preloved condition, sold as a set. Please see my feedback and my other great items for sale. Beautiful slightly used Pandora amethyst sterling silver ring. Size 7. Beautiful slightly used Pandora amethyst sterling silver ring. Size 7. . Shipped with USPS First Class Package. Ring has a pale green gemstone and is a size 7, bracelet is a blue braided rope with a sterling silver clasp. Silver is marked. Bought out a Pandora jewelry closeout. Genuine Pandora, never worn. Type of Jewelry: Ring. Total Weight of Item: 2.1grams. You can count on us to be factual and have clear accurate photographs which are not "edited" to deceive. Pandora 14K ALLURING BRILLIANT MARQUISE CZ Stack Ring. PANDORA | STERLING SILVER "FOREVER LOVE" RING(#190837). AUTHENTIC, RARE & RETIRED! 11x Size 61 (#190837-61). 1x Size 60 (#190837-60). 10x Size 58 (#190837-58). Due to highly subjective coin grades, we provide high resolution photos for self-grading. The item must be in the exact condition received. Here I have a great item in an Authentic Pandora 925 ALE Sterling Silver CZ My Princess Tiara Crown Ring. The ring is a size 8 1/4. It is about 1/2" at its longest on the finger. PANDORA RING. DANGLING HEART LOCK RING. STERLING SILVER. At living color world, we WILL NOT Jeopardize my fathers honor nor our reputation of having sold upwards of 1000 Pandora beads, both new and retired, without a single incidence of Pandora inauthenticity! This is a beautiful Pandora sterling silver ring with sparkling cz gems in an antique style setting. Pandora Ring. 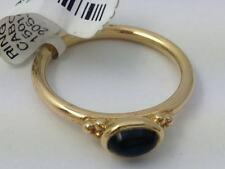 This ring is preowned and it is in good condition. • Item number 150143AQ. Gleaming 14K yellow gold pairs perfectly with icy blue aquamarine in this rare and retired Pandora ring. • 14K yellow gold with genuine aquamarine and. 01 ct GH/VS diamond. Silver is marked. Bought out a Pandora jewelry closeout. Genuine Pandora, never worn. Size or Length: Width:~2.3mm; heart:~7x7mm. Type of Jewelry: Ring. You can count on us to be factual and have clear accurate photographs which are not "edited" to deceive. Great set of pandora rings, excellent condition. i wore these together. no smoker. STERLING SILVER BEAUTIFUL PANDORA DESIGNER PINK AND WHITE ROSE BLACK BEAD BAND RING. WEIGHT: 5.8 grams. SIZE: 3.25. Bought out a Pandora jewelry closeout. Genuine Pandora, never worn. Gemstones: CZ. Size or Length: Size: 6.75; width of band at bottom:~2.1mm; top:10.8mm. Type of Jewelry: Ring. You can count on us to be factual and have clear accurate photographs which are not "edited" to deceive. Up for sale is a beautiful sterling silver, 14k gold, & diamond Pandora Morning Star ring. 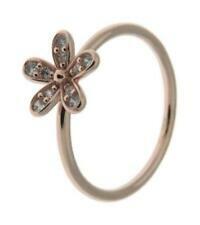 Don't miss out on this beautiful Pandora Morning Star ring. It would make a great addition to your jewelry collection. ~ Beautiful Authentic PANDORA 925 ALE Sterling Silver Quietly Spoken Smooth Band Ring ~. The ring was crafted by Pandora in solid 925 sterling silver and has hallmark " 925 ALE ". Pandora Ref. This is pre-owned / retired ring so the sterling may reflect light tarnishing due to age and normal marks of wear, otherwise very nice & pretty ring. PANDORA | Sterling Silver "Laurel Wreath" Ring(#190922). AUTHENTIC, RARE & RETIRED! Pandora He Loves Me Ring Sterling Silver and 14K Gold 190613D Size 7. Very Rare.